Recently i was working on some Windows Phone project. I remembered that one of the improvement with the latest SDK for Windows Phone 7.1, was the introduction of a new tool that will help developers to test their apps prior to submit them to the Marketplace. This was a great idea because many were complaining about the time it take it take for an application to go through the Certification process. First, the certification process is pretty complex, on the tester side. It require automatic testing done by a server, which is fairly fast. Then, the apps is tested manually by a tester, this is the part of the process which take longer to complete. Try to imagine you testing an application that you don’t know the purpose and how it work. For my part, I really don’t want to be in their pants! From my past experience, they are doing a very good job. To return to the main subject, a new tool is now available with the SDK which is called “Marketplace Test Kit”. This will guide the developer through all the test that are done by the automated process and the manual testing. Now you have the first screen that will allow you to enter all the information required by the automated test process. The next section is the Monitored Test, these tests are manual but a log is generated and analyse automatically base on the the navigation you do while testing the application. This look for memory issue, navigation pattern issue, performance. Do execute the test you need to have your phone connected, because the test is done using the device. So if you don’t have a device you won’t be able to process those tests. The last step is 100% manual. So these must be done manually and you must use your own judgement to identify if the test “Pass” or “Fail”. You just need to follow the instruction. This may be less or more complex depending on your application. In conclusion, testing your application must be a task you must do for each application (version) prior to submit to the Marketplace. This will make sure you won’t wait for the certification for bug that you could have trapped doing those tests. Also, by doing those test you will improve the quality of your application and you will help improve the delay for the certification process. Tomorrow, Microsoft is holding a conference about the new version of Windows which is called Windows 8. My colleague Laurent Duveau is on site to find out the latest information about the new feature of the new version. On my part, I'm looking forward to the touch interface that will improve the UX for Windows based slate. I’ll also try to see what knew about the development. There was a lot of talk about HTML5 but i think Microsoft will show us something more interesting and base on XAML. I’ll post more information about the new stuff. Recently i have the opportunity to work as a Technical Reviewer for a book written by Todd Spatafore. This book is about the creation of Windows Phone 7 application which integrate with SharePoint. Windows Phone 7 offer a native integration with SharePoint, but sometime you need to create enterprise application the will require to connect with SharePoint. In the last 2 month we have been busy working on a great Windows Phone project. We created the Tou.TV for Windows Phone. www.Tou.tv is a French website from Radio-Canada that allow the user to view TV show online. So had to create the same experience but using the Windows Phone standard. So we had the chance to work with technology like Smooth Streaming. So SMF (Silverlight Media Framework) were a nice asset in that project to handle the video. We used some caching technology to improve the performance of the application. Also, we used the Telerik RadControls for Windows Phone to help us make the application more interesting by implementing some animation and page transition the provide in their toolkit. We have been able to be in direct contact with the dev. team of the controls. We had great support from them by providing us with overnight fix on some bug that we’ve found. Since one week the version 0.9 is available, and from the review we were able to provide an application of quality, which is really great. That was a nice experience, be able to provide our knowledge in general public application. And i can says that we also learn a lot from that experience. Recently I've been working on a project and we discovered something that have some impact on the performance of a Windows Phone application. This is probably a mistake that we did when implementing the code, but it may be the kind of mistake that many developer will do. Quickly, each time we were calling the web service we were validating the network connectivity by validating the property “ NetworkInterface.NetworkInterfaceType ”. Behind that property, there is a process that validate the connectivity. This process is calling a page “http://www.msftncsi.com/ncsi.txt” to see if there is any connectivity and which type of connectivity. But the problem is that is done synchronously. So in our case we were calling multiple times this process, which result to execute the process of validating the Url mention before synchronously multiple times. So each web service call must wait for the network validation before executing the call. And because it’s on the web the response can be fast and can also be very long before we get the response. In our case we did implement a wrapper that make sure that the call is not done to often. This help us improve the performance of the application start-up. Also this help to improve activation process after the application Tombstone. 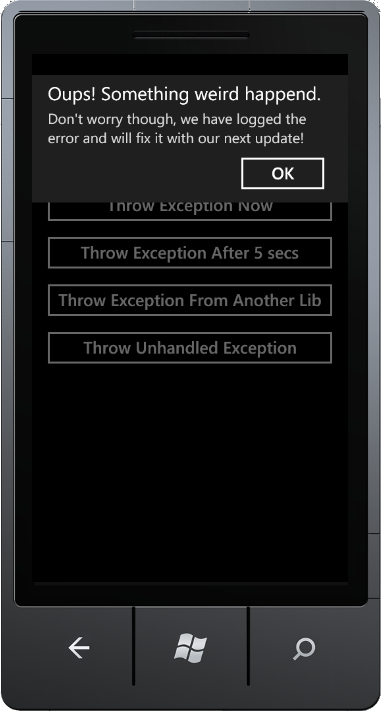 So make sure to validate our Windows Phone 7 application by using a tool like fiddler. This will help you improve the performance and stability of your application. Almost 4 month have passed since the release on the market of the Windows Phone devices. With now over 8,000 apps, a lot of code have been written. So many controls manufacturer have release controls for Windows Phone 7. Some are free and some not. But in the end the is now a good set of controls available on the market to help the developer to build nice and appealing application. Recently, the Silverlight Toolkit for Windows Phone was update. This release provided some new controls and some improvement on the existing controls. Telerik is also providing some nice controls. Telerik provide nice transition and animation controls. We used some of those controls some of our recent project. They are currently in beta but they are working like RTM product. I had the chance to be in contact with the dev team to help us solving some issue in the beta and i can tell you that the team is really dedicated to provide the best controls. Last week ComponentArt released a version of their Data Vizualisation for Windows phone. This set of controls looks very nice (i didn’t time to test the control, but i will review the controls in a couple of days). If you plan to create a dashboard with some Charts, Gauges, Maps, Gridviews, etc i suggest you to give a look at this set of controls. This open source project provide some nice feature that are not available in any other project. This project is a good complement and a good base for any Windows Phone project. This set of controls provide feature that help to work with MVVM Light. The feature are mostly behind the hood, like Cachine, Messaging, Service and some ui controls. 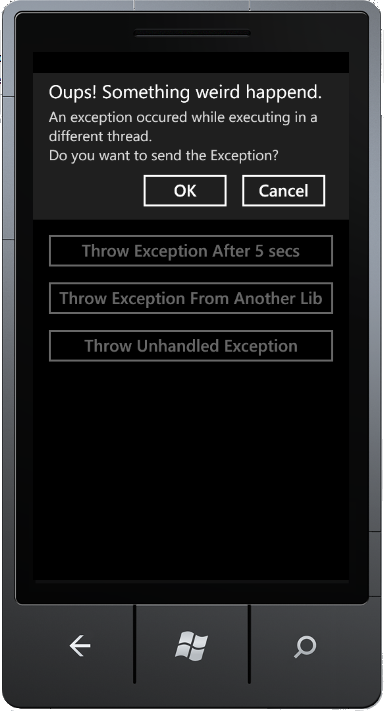 Developing application for Windows Phone 7 can now be done using some controls (without having to create them manually). Those controls provides rich visual and are easy to implement. So creating a portable dashboard for a sale department or a social network application is now an easy task with all those controls. So give it a try, like we did in our projects.